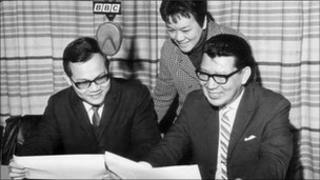 The BBC Chinese Service has made its final radio broadcast in Mandarin after nearly 70 years. From now on, Mandarin-speakers will be served only by the BBC's Chinese-language websites; a weekly radio broadcast in Cantonese will continue. BBC managers say they have had to make tough choices because of a 16% cut in UK government funding. The final Mandarin language broadcast, on 25 March, came a day before the BBC's Vietnamese service transmitted its last radio broadcast after almost 60 years on air. The Vietnamese service will continue to produce Online content for some 450,000 weekly users. BBC World Service Mandarin programming began back in 1941, pre-dating by eight years the proclamation of the People's Republic of China. To a country starved of information, BBC Chinese carried news from inside and outside China - most notably of the Vietnam War and Mao Zedong's Cultural Revolution in the 1960s and 1970s. In June 1989, with the world's attention on the democracy protests in China, more and more Chinese tuned in. Joseph Ren, who began working for the Chinese service in 1970, said the broadcasts were very important. "Via our letter-boxes in south-east Asia, we got a lot of letters, so we knew that they were listening to us. "They could hardly get any news about the world, and hardly anything about the rest of China, so they listened to us in secret just to understand the world and understand China itself." Chinese sailors were avid listeners, carrying home what they had gleaned from the transmissions from London. But with leader Deng Xiaoping's economic reforms in the 1980s, China began opening up. Later, the internet delivered new ways to serve those hungry for global news. Anxious to control their citizens' access, the Chinese authorities built what is known as the Great Firewall, blocking many foreign news sites - including that of BBC Chinese. The head of the Chinese service, Raymond Li, believes China's Mandarin-speakers will still be adequately served by the BBC. "You need a bit of effort, but having said that, a lot of people as far as I know actually are using what they call proxy servers or proxy sites. "It's not ideal. But then of course, away from online, actually we know the mobile technology has taken up. A lot of people in China are increasingly using mobile phones to access foreign media websites." So for the BBC, the future is digital. And also, it seems, for the Voice of America, funded by the US government. It, too, plans to shift Mandarin to a web-only service. The English-language version of one of China's largest papers, the Global Times, called it the "end of an era". The Western broadcasters contend they have simply moved with the times.